I think the best part about sewing is the ability to change the look of a room so easily. 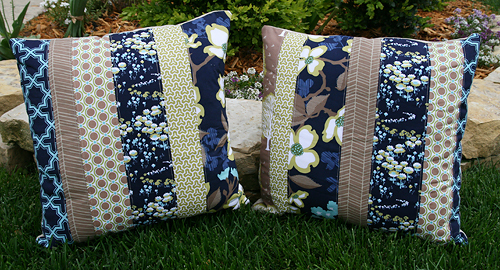 In fact, these pillows could also be called the "Update-Your-Family-Room-in-1-Nap-Time" pillows. 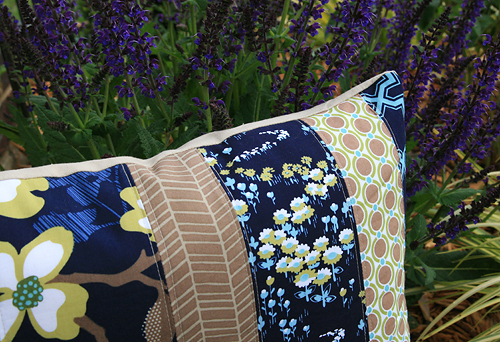 I was ready for a change on my couch and had been looking at Joel Dewberry's Modern Meadow collection since I went on my trip to the Fabric Shack. I wanted something simple as I was getting tired of my string block pillows...started to get too busy for my eyes. I just cut random width stripes of fabric and then quilted them with a straight line on each side of the seams. The back is an awesome linen that Fabric.com sent to me accidentally. If I knew what it was, I would probably buy yards and yards of it. It is perfect. I finished them off with an invisible zipper - I'm getting quite good at those. And voila, instant new look!